There are approximately 502 million radios in America. For this savvy, far-reaching diary, celebrated journalist and author Sarah Vowell turned hers on and listened—closely, critically, creatively—for an entire year. 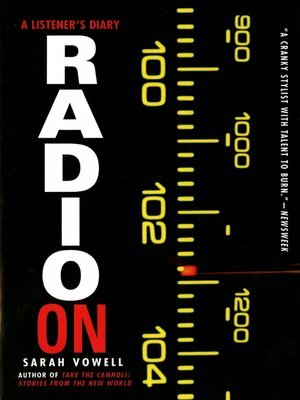 As a series of impressions and reflections regarding contemporary American culture, and as an extended meditation on both our media and our society, Radio On is a keenly focused book that is as insightful as it is refreshing. Called "a national treasure" by David Sedaris, Sarah Vowell has been a contributing editor to public radio's This American Life since 1996. She is also the author of the bestsellers Take the Cannoli and The Partly Cloudy Patriot.